We’ve known about 3.0 for some time and today Apple revealed a few more nuggets to get you excited about the upcoming OS upgrade on the iPhone. Cut, Copy, Paste: Works across apps, undo support, developer APIs. MMS: Support for sending Photos, contacts, audio files, etc over the cell network. 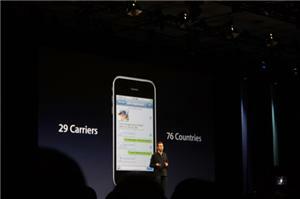 24 carriers will support iphone MMS at launch. Search: Search throughout contacts, calendars, notes, email, etc. “The great part about searching your email:” not just local messages, but messages that are back on your mail server. In other words: One-page searches across the phone. Parental Controls: In addition to controls we already support, such as youtube/safari support, we’ve added other items: You can now filter by movie/tv-show content via parental controls. You can now limit app usage by age ratings. Tethering: Tethering works w/ Mac/PC, USB or Bluetooth. “It is a seamless experience – once it’s on, there’s no need for tethering software on your computer.” “Like MMS, it requires carrier support. 22 carriers at launch. Telefonica, TIM, Rogers, more.” Doesn’t look like AT&T will support tethering. New language support in OS 3.0: Hebrew, Arabic, Greek, Korean, and Thai. The iPhone now supports over 30 languages. Find My iPhone: As MobileMe service if your iPhone is ever lost FMI will show you where it is on a map by sending your phone a message via landline. An alert sound plays whether phone is on silent or not. Send remote wipe command if it’s lost or stolen. In App Purchases: Renew magazine subscriptions. Sell additional game packs in games. Free apps remain free. No bait and switch. Accessories: Software apps that talk right to accessories, like the 1-touch-blood glucose monitor. Apple has really opened up to third-party accessory manufacturers. Maps: Embed Google maps right into your applications. Custom map apps. Turn by turn direction applications. Push notifications: Generic push notification service. Push numeric badges, messages, and alert sounds. 3.0 release date: Woohoo! I should probably take my borked iPhone 3G into the Apple store before June 17th so I can get my free upgrade to 3.0. The OS upgrade will be free for iPhone and iPhone 3G owners. As always, Touch owners will have to pony up $10.